It has been a while since my last post. I’m still healthy and my vision is still improving, albeit a lot slower than I had hoped. The last couple of months has been very busy, with work and a couple of trips and great weather. During my July appointment I was able to read the 20/60 line on the eye chart. Even though I’m still seeing the multiple images, which affects the sharpness of my vision, I have noticed things getting a little better. Something that amazes me some days is that I’m able to see depth, especially objects within a couple of feet. It’s a strange feeling that I’m still getting use to. I’m also able to see things close up (6-8 inches) very well, although things go out of focus after that. The funny thing is that, as I approach 40, the vision in my “good” eye is getting worse up close, so I find myself using my “bad” eye for reading small print and my “good” eye for seeing everything else. I guess this is better than asking my wife to read small type for me like I used to. I have only had one problem so far… during my August appointment, my eye pressure was high. 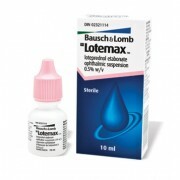 My doctor took me off of the Prednisolone Acetate drops and switched me to Lotemax drops, three times a day. He also had me take Travatan drops to lower the eye pressure. I returned a week later and the pressure was still high, so he cut the Lotemax to twice a day and also prescribed Combigan twice a day. These drops irritate my eyes a lot more, but hopefully they are lowering the eye pressure. I go back again on Friday, so hopefully I can get back to a regular routine. So after seven months, with seven stitches removed, here I am. I’ll try to post something sooner.